Oh of course. Our competitor is the original Pennywise because the new IT movie is coming out tomorrow (with the new Pennywise as well). Classic promotional tactic. But anyway, don’t look into his deadlights! If you don’t, you might have a chance to win this staring contest. But, seeing that you need to look him in the eyes to be victorious in this particular challenge pretty much means that you’re fucked. Oh well – I’m sure it’s not so bad in the deadlights. Maybe you could even get a nice fruity alcoholic drink while you’re there. Don’t forget your balloon! Don’t you want it? Don’t you want it? Don’t you want it? Beep Beep. You lose. 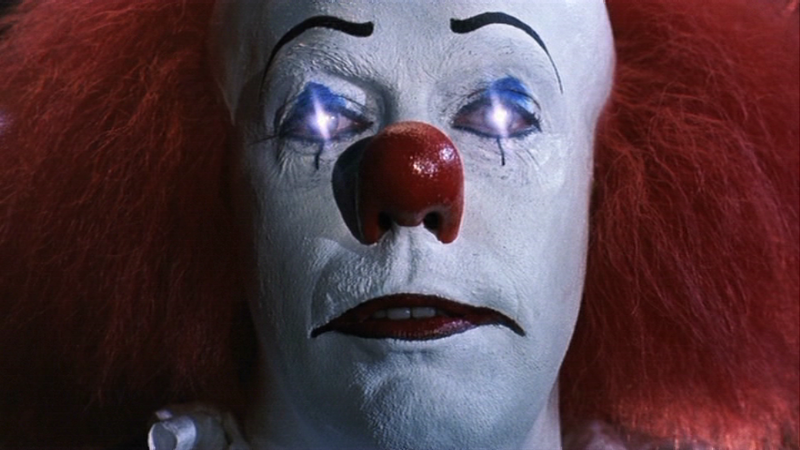 This entry was posted in Feature and tagged clown it pennywise, creepy clowns, deadlights, dirty horror, it deadlights, let's have a staring contest, pennywise, pennywise clown, pennywise deadlights, pennywise the dancing clown, staring contest, tim curry pennywise by Dirty Horror. Bookmark the permalink.